Over the past week, I have spent the majority of my time immersed in preparations for the annual Ten Grands concert, a benefit for noted musician and composer Michael Allen Harrison’s Snowman Foundation. In a time when arts education is being affected by budget cuts in schools nationwide, the Snowman Foundation is dedicated to bringing access to music education to the Portland, OR community and beyond. As someone greatly shaped by having had ample access to music education, via private lessons in piano, voice, clarinet, as well as summer music camp attendance and participation in school choirs, I am a firm believer in the value of learning music and the Snowman Foundation’s mission. Therefore, I could not have been more excited and enthusiastic about being the designated piano tuner for the foundation’s annual preeminent event, in which ten gorgeous Steinway grand pianos are situated on one stage for a concert featuring a variety of local artists, ranging from ridiculously talented middle-school guitarists to renowned recording artists such as Tom Grant. While I have been backstage for a number of events, the Ten Grands concert, due to a wide range of requirements that went far beyond lifting 760 lb. instruments onto 3-4 foot high platforms, was the most intricate, chaotic (as in elaborate, not disorganized) stage setup process I have ever witnessed. Michael Allen Harrison’s personal piano, a majestic Steinway and Sons D, loverly adorned with the signatures of other pianists who have performed on the instrument. My preparations began early last week with pre-tuning the pianos generously provided by Classic Pianos for the concert at the piano store prior to their being transported to the venue. In addition to the ten pianos being used on the stage, pianos were provided for the concert hall lobby, as well as the Heathman Hotel, where a pre-concert reception was held. Luckily for me, Michael Allen Harrison’s personal piano was also set up at the store, which allowed me to pre-tune all but two instruments being used for the concert. The goal of tuning the pianos beforehand was to minimize the amount of tuning I would have to do at the theater, where I had limited windows of time, in addition to being surrounded by the hustle and bustle of the stage setup. Upon arriving at the Arlene Schnitzer Concert Hall the morning that the pianos were due to be delivered, I initially went down to the basement knowing that the house piano was located there, then turned around and promptly went back upstairs after discovering that the basement is a labyrinth. I met the stage crew leader J.D., and he led me to the correct room in the basement that I certainly would not have found on my own even if I had tried. Thanks, J.D.! 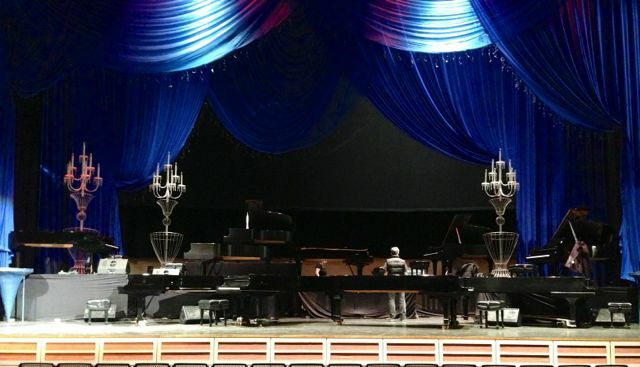 The house piano for the Arlene Schnitzer Concert Hall. And yes, I certainly do use piano lid props as coat hooks on a regular basis. After finishing the tuning on the house Steinway D, I headed back upstairs to the stage where the A-Z Moving crew had arrived with the rest of the pianos. Employing the “many hands make light work” concept, the movers set up the pianos on the stage floor, then joined forces with the stagehands to lift the pianos up onto raised platforms. I tried to stay out of the way while the pianos were being set up and positioned throughout the stage, but it seemed that I repeatedly managed to step in the path of a stagehand no matter where I tried to stand. Eventually, the pianos were set up to a point where I could check the tunings and touch-up any notes in need of a little TLC after the move, which is normal for pianos placed in a new environment. A view of all ten pianos from the house. Over the next couple days, as I was called to the theater to make a few minor adjustments on the pianos, I took advantage of my surroundings and explored the beautiful, historic venue apart from the stage, where I ran into acclaimed local jazz artist and Ten Grands performer Tom Grant signing posters in the lobby. On the day of the concert, which I attended as a member of the audience, I did one final double-check for fingerprints on the piano cases and a minor tuning touch-up behind the curtain as I heard the audience begin to fill the sold-out theater to its 2,776 person capacity. Behind the curtain, about 45 minutes before the start of the show. With that, I stowed my tools and cleaning supplies away in my car (ok, ok, I had my tuning hammer AND a screwdriver AND a set of wrenches in my purse JUST IN CASE, which I’m quite sure is TOTALLY what Burberry had in mind when they designed it) and made my way into the theater via the Park Ave. entrance. The show was spectacular, especially with the inclusion of various young musicians who have the most to benefit from the foundation’s mission. With a diverse range of music, including a Beethoven mash-up, Twinkle Twinkle variations (I swear that is way cooler than it sounds; I’m not talking about your beginner’s Twinkle Twinkle here), Led Zeppelin, Queen, the acclaimed perfomers’ original compositions, the program closed with a fabulous Elton John medley. I am so glad to have been a small part of such an amazing event that fully showcased the beauty of music and pianos, as well as the benefits of music education that are the bedrock of the Snowman Foundation’s mission. To contribute to the Snowman Foundation or to learn more about their cause, please visit their website at snowmanfoundation.org, Michael Allen Harrison’s website at michaelallenharrison.com, or check out the Classic Pianos Snowman Foundation piano sale from April 4-7, 2013, which contributes a portion of the sales proceeds to benefit the Snowman Foundation. To attend or purchase tickets for a Ten Grands event (there is a concert at Seattle’s Benaroya Hall on May 11, 2013,) please visit tengrands.com.